When preparing to coordinate a wedding, I always work with the couple to gather as much information as possible about every element of their day so that I am fully prepared when the time comes. It also gives me the opportunity to advise them of any areas where I foresee potential challenges. One such instance happened heading into a beautiful August wedding on a picturesque country farm. When chatting with the couple (who were very lovely people) about their wedding cake, they let me know that the sister of the groom was making it for them. Of course I was excited for them as I knew how special it would be to have a family member contribute to their big day in such a big way! I proceeded to ask when she would be dropping the cake off at the venue and if it would need to be refrigerated. Red Flag #1 - There was not an actual kitchen at this barn venue. There was an outdoor kitchen with a three-bay sink, refrigeration and counter space to work on. However, I was pretty confident that it was not a conducive setup for assembling and decorating a wedding cake. Red Flag #2 - We had been having a very hot and super humid summer. 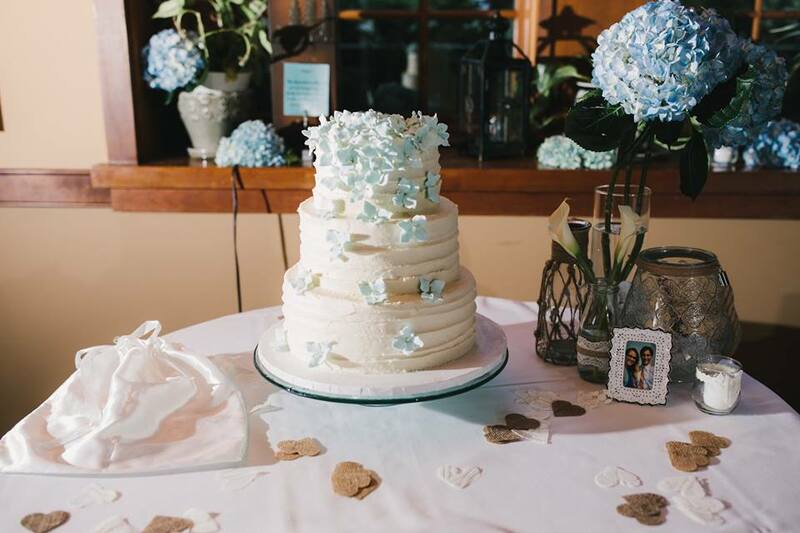 My gut feeling was that trying to ice and assemble a wedding cake outside in August - in the heat and humidity - seemed like it would not end well. I would love to stop the story here and say that in the end I was wrong and everything worked out just as planned. Unfortunately, years of experience and my magical wedding intuition proved me right. The day before the wedding I arrived at the venue in the early afternoon to do final walk-through with the couple, help with some setup and guide them through their ceremony rehearsal. After the rehearsal, I hung around for a little while tying up some odds and ends. As I passed by the outdoor kitchen area, I noticed the groom’s sister hard at work. Of course I stopped by just to inquire how the wedding cake making was going. I could clearly see that she was quite frustrated and even looked a little panicked. “It is so wonderful that you are doing this for your brother! How’s it going?” I asked. She picked her head up from the bowl of icing and looked at me like a deer in headlights. “I just don't know what I'm going to do,” she said. “This icing consistency is not what I need it to be. It’s not staying on the cake and it’s sweating everywhere. On top of that, all of my fondant decorations are melting. Is there anywhere else that I can go to finish this cake?” My heart went out to this poor woman and much less of opening up the trunk of my Jeep and turning on the air conditioning, I really didn't have another solution for her. “What are we going to do?!? !” she pleaded. “Have you ever had this happen before?” I was afraid to tell her that I had not had this “exact” situation happen to me before for fear that she would have a nervous breakdown. However, I calmly explained that but this was not my first rodeo and certainly not my first major wedding challenge. “My business is named L.C. Solutions for a reason,” I assured her. “We will figure this out.” While this woman in no way assumed that I would be responsible for her mishap, she was 100% assuming that somehow - some way - I was going to save the day. As I mentioned earlier, having great relationships with other wedding vendors and being able to think on your feet are two imperative skills for being a wedding planner. As luck (or preparedness) would have it, I had a great relationship with a baker in a nearby town - just about 25 minutes away. Since it was Friday afternoon and we did not need the cake until Saturday afternoon - I asked her if I could contact this baker and see if I could pull a favor. She optimistically agreed and said that she would assume the responsibility of paying for the cake since it was originally to be her gift to them. She also asked that I did not mention any of this to the bride and groom. She did not want to upset them and I couldn’t agree more. If we could solve the problem between the two of us, that would be best. Since the bride and groom were still at the venue it was going to be tricky to explain this away. We decided to tell them that she felt it would be best to decorate the cake the next morning when it was a little cooler outside to make the icing be more workable. Of course she and I both knew that taking that chance was unrealistic at that point - but the story stuck and the bride and groom went along with it. Meanwhile I immediately got on the phone and was able to reach the baker. She chuckled a bit when I explained to her what was going on. “Lisa,” she laughed, “I don't know how you live your life on the edge like this every weekend. Just thinking about this situation gives me knots in my stomach!” While she had a busy wedding weekend herself, she was able to arrange her schedule in order to help me out. All she needed was a photo of what the cake was supposed to look like and a delivery address. DONE! When I asked the groom’s sister for a photo of her vision for the cake and told her that I had found a replacement - she squeezed me so hard I thought my eyes were going to pop out of my head. “You are a miracle worker!” she exclaimed! With a huge sigh of relief and an immense feeling of gratitude, she reached for her phone and sent me the photo. The cake arrived promptly the following day while the ceremony was in progress in another area of the property. The bride and groom never knew otherwise and everyone enjoyed celebrating sweet, sweet love. Following up with the happy couple a few weeks later, they let me know that the groom’s sister came clean at the farewell breakfast the following morning. Everyone had a good laugh and a potential tragedy turned into a big belly laugh and a great story to tell!